Last Saturday saw some respite from the hot weather of the previous couple of weeks and many SOTA activators headed for the hills. I was no exception.I’d planned a full day in the Bunyip State Park and the Yarra Forest with four summits on the card. I was confident I could fit four in as I have been to them all at least once, two of them twice, before. My original plan was to activate this hill at about 10:00 am but I got away from home an hour late because I couldn’t finder my hike boots. It also took me a long time to get to the summit. The distance traveled from the car to the summit was 1.7 km. I covered the first 1000 metres on easy to follow tracks in 15 minutes and the last 700 metres took 70 minutes. Such is the density of the fire regrowth nearer the summit. Still this was quicker than my activation in 2013 where progress slowed to 20 minutes for 100 metres. 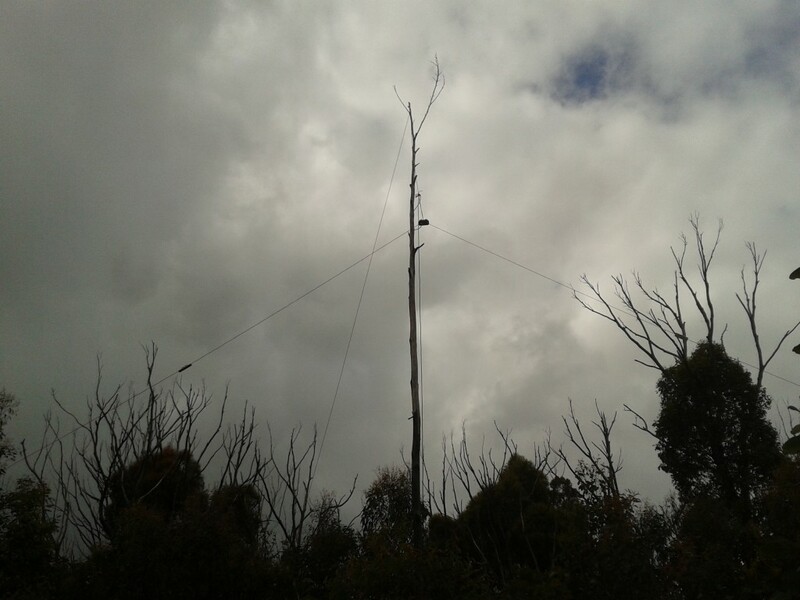 Once on the summit I threw a rope into the dead tall tree on the summit and hoisted up my linked dipole antenna and got on air about 15 minutes before the UTC change over with lots of chasers keen to get the double points by making contact either side of 0000z. I made 35 QSOs on 40 m and 4 QSO on 12 m, adding further to my 12 m challenge score, including summit to summit QSOs with Peter VK3PF and Rod VK2TWR who were activating an unnamed summit VK2/SM-036 and Ian VK1DI on Mt Stromlo, VK1/AC-043. I took a different route down the summit which, although slightly longer, proved to be easier going with less dense bush to be navigated. The time from summit to car was 51 minutes for 1.8 km. I have loaded the GPS track files of my routes here, although I am not recommending them as the best way in or out. The next summit on the plan was Gentle Annie, which is accessed from the same road junction as North Hells Gate. Last time I activated Gentle Annie I walked from the junction because I was driving my wife’s two wheel drive SUV. On this activation I had my four wheel drive RAV4 and, apart from one particularly steep section, it was an effortless trip to the top. Not having to walk up brought me a little closer to my original time schedule.In accordance with the SOTA rules I packed my back pack and headed back down the hill until I was well out of the activation zone and then walked back up and set up on the other side of the summit from the car. Again I strung the antenna in the tree and works stations on 40, 20 and 12 metres. 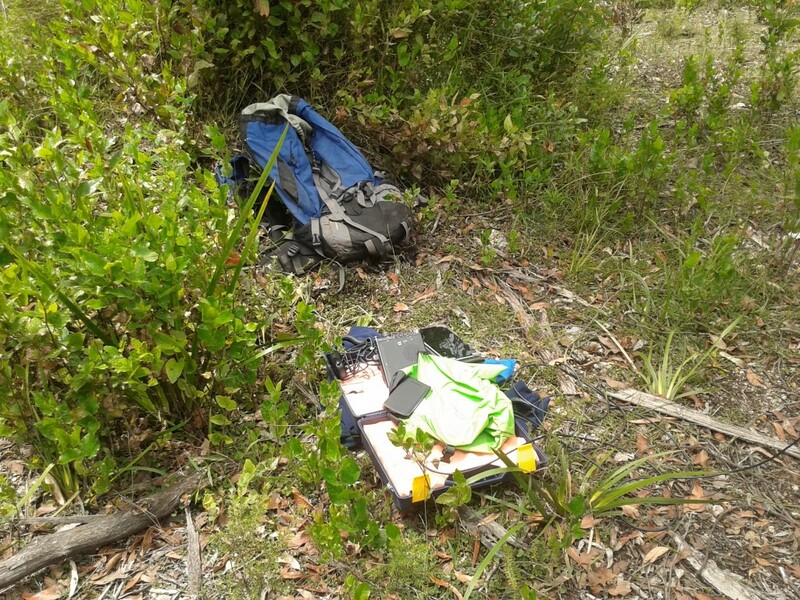 Because this activation was after the UTC roll over, and the opportunity for double points had passed, I worked 19 stations, including a summit to summit contact with Nick VK3ANL on Mt Moliagul, VK3/VN-024. Having completed two summits I headed east along Quartz Creek Rd to Robertsons Creek Fireline. I parked at the junction and walked up the steep track which intersects with South Hells Gate Track, continues on getting steeper until the summit. This was my thrid activation of South Hells Gate having been here in 2012 and 2013. 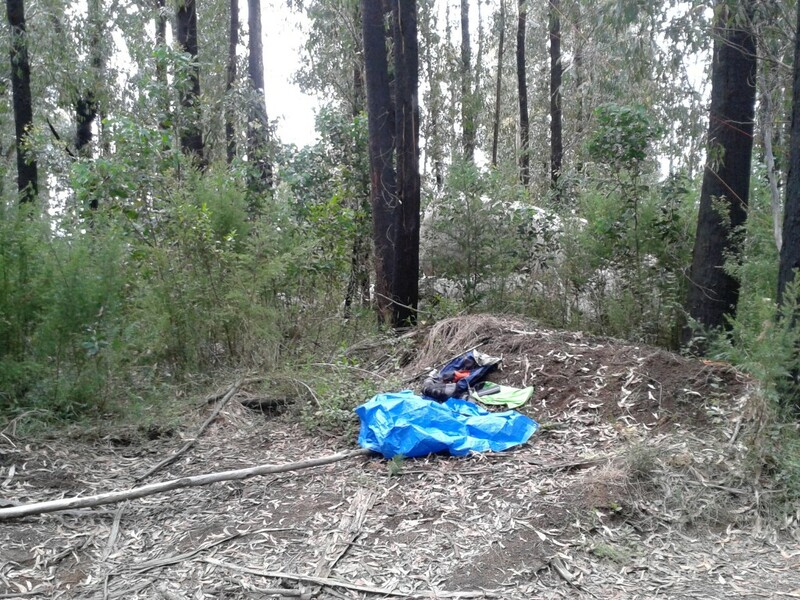 Keeping with the other summits I threw a rope into the trees, helped along with my 16 oz, 453 grams throw bag, I was quickly on air and worked 13 stations including Brian VK3MCD on Mt Loch, VK3/VE-005 and Bernard VK3AMB on 12 metres. The last summit for the day was Spion Kopje. Like South Hells Gate I have been here in 2012 and 2013. Last time I was here I decided that next time I visited I would collect the broken glass from the old fire spotters tower and take it away. 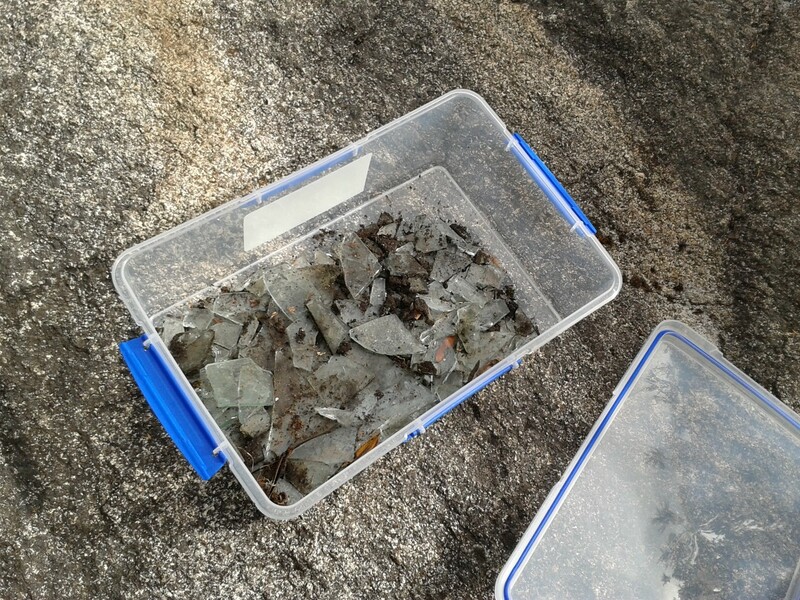 Armed with a suitable container I collected about 1 kg of plate glass from around the summit and took it away for disposal. Knowing there were few suitable trees on the summit I took my squid pole to the top. I made 26 QSOs including summit to summit QSOs with Brian VK3MCD on Mt Hotham, VK3/VE-006, Nick VK3ANL at Mt Alexander VK3/VN-016 and Peter VK3PF at unnamed summit VK2/SM-053. When packing my squid pole at the end of the activation I misjudged the effort required to collapse the final section and broke it in half. This was a bit of a disappointment in an otherwise excellent day out. With four old summits now in the log for a second or third time, I headed home. With the weather warming up again it will be a month or so before I venture out into the hills again. Hi Peter, I always enjoy reading your accounts of your SOTA activations. I am just a bit envious of the SOTA peaks you have in Victoria: a view I have expressed previously. What prompted my comment was the work you did in collecting the broken glass as shown in the photo. We do this ourselves where possible. On one occasion, Heathcote-Graytown NP, the rubbish pile needed a 6 x 4 trailer! Another activity we do is drag dead animals (usually kangaroos) off the roads. This is critical with Wedge Tail Eagles, who simply cannot get out of the way of large vehicles quickly, but other raptors, like kites and even corvids ‘crows’ can come to grief!